Water in the morning or evening so the plants have water during the heat of the day. It’s been long, hot summer – now are the dog days when the garden starts to look a bit done in by the heat. Many times we as gardeners don’t know how to water our gardens. Keep reading for some tips on when to water, how to water and how often to water our gardens to beat the heat. Don’t water in the heat of the day. Water in the morning or water in the evening in the cool of the day. Watering when it is cool reduces evaporation and makes the water available for your plant when it needs it the most – during the hottest part of the day. Watering at the base of our plants helps keep the leaves dry and control diseases. 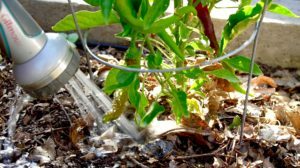 Water at the base of your plant with drip irrigation or a nozzle, because overhead watering can splash water on the leaves of your plant and cause diseases. Keeping your plant leaves as dry as possible helps control common garden diseases such as powdery mildew, blight, leaf spot and many more. The frequency of watering really depends on the weather where you live. In hot, dry weather you will have to water more often than you would in cold or rainy weather. 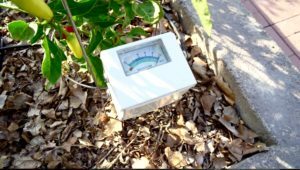 Check the moisture level of your soil with a moisture meter before you water. 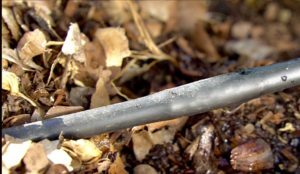 Check the moisture level of your soil frequently to determine whether or not you need to water your plants. This is very easy to do either with a moisture meter or with your finger. If the moisture meter shows that your soil is wet, you don’t need to water. Most moisture meters can be calibrated according to the ideal moisture for your particular soil. Put the probe of the moisture meter into the soil, if the moisture meter shows that your soil is wet, you don’t need to water. If it is showing that your soil is dry, give your plants a drink. 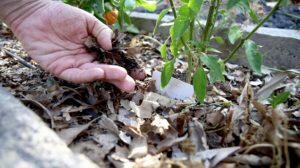 Check for moisture by sticking your finger into the soil. To check with your finger, simply stick your finger in the soil as far as you can reach it at the base of your plants. If the soil feels wet, you don’t need to water, if it feels dry, water your plants. Rather than quick watering sessions, water your garden less frequently, but water slowly, deeply, for longer periods of time. And of course, always water at the base of your plants. This helps the water get way down to the roots where the plant needs it the most. Water with drip irrigation for a slow, steady drip that gets to the roots of your plants. 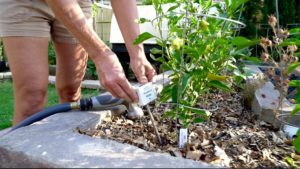 My favorite way to water is with a drip irrigation system because you get a nice, slow, steady drip that sinks deep into the roots of your plants. I have a timer set up for automatic watering, but be sure to check your garden regularly to see if you are watering at appropriate intervals. Water at the base, let the water sink in, then water again. 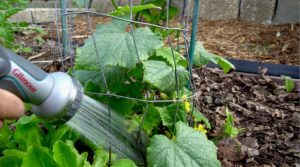 If you are watering with a nozzle, water slowly at the base of your plants, let the water sink in, then repeat, letting the water sink again so the it gets all the way to the roots. 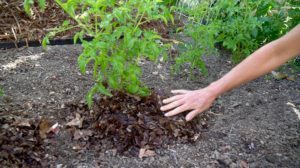 Mulch helps with water evaporation, and means you don’t have to water as often. 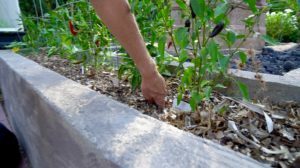 The most important thing you can do for the welfare of your garden during the hot summer days is to check your plants daily to see if they need water. And mulch, mulch, mulch with shredded leaves, straw, or quality wood chips. This cuts down on water evaporation, which means that you have to water less often, especially during the dog days of summer. Watch the “2 Minute CaliKim Tip” video from my YouTube channel, “Watering Your Garden in the Summer to Beat the Heat: When, How and How Often” so you can see exactly what to do to be water your garden effectively during these hot summer days. Comment below – let me know how your garden is faring in the heat! Thanks for the post. It has been very hot in my neck of the woods. Jamaica. we had almost record heat of 98 F on Thursday. I have a 11×3 garden area that gets 5 he’s of direct sun a day, my garden is all planted in Smart pots. My ? To you is can you over water in these pots? My tomato’s seem to of stopped growing in size. Tomatoes really benefit from consistent watering, but are also really heavy feeders and consistent watering can literally “wash” the nutrients right out of the soil in raised beds or pots. Do you use a fertilizer regularly on your tomatoes? I am loving the results that I am getting from the Vermisterra worm tea as well as MIGardener’s new fertilizer, Revive RX. You can find both of those through the Partners Store tab up above. Keep me updated on how your tomatoes are doing and happy gardening! Gardening for me has been interesting. I have a small container garden on my patio. I have been using smart pots and the City Patio Pickers which is doing well. So far this year, I have harvested 10 hot peppers, 1 green pepper, 1 tomatoe and 1 yellow squash. I also have a few Aerogardens which I have harvest lettuce from. Two days ago my large Vegepod arrived, I put it together but it is storming where I am so I have to wait to plant anything in it but I am excited. I also have a Tower Garden coming so excited to be growing my own food. Love that you have joined the community of Vegepod owners! The results that I am seeing from the Vegepod are really simply astounding. Sounds like you are getting a good harvest this year from your garden. Keep me updated and happy gardening!